, an eminent and learned prelate, was born in Ireland, at Kilcrin, near Thomastown, the 12th of March 1684. He was the son of William Berkeley of Thomastown, in the county of Kilkenny; whose father, the family having suffered for their loyalty to Charles I. went over to Ireland after the restoration, and there obtained the collector-ship of Belfast. 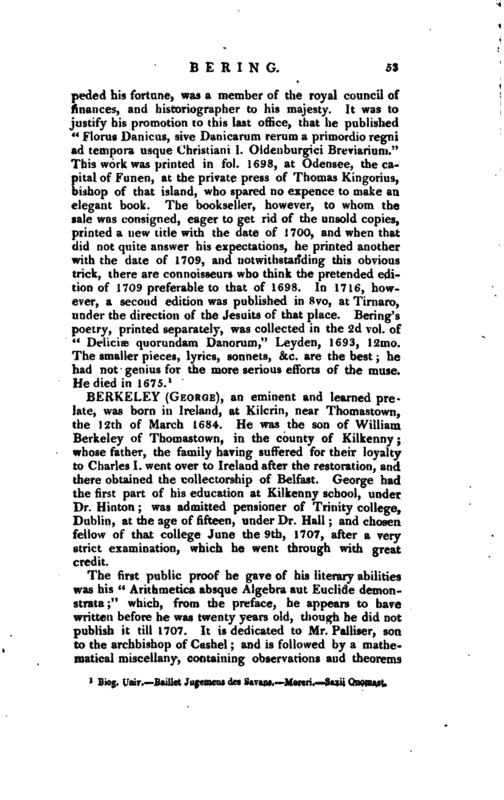 George had the first part of his education at Kilkenny school, under Dr. Hinton was admitted pensioner of Trinity college, Dublin, at the age of fifteen, under Dr. Hall; and chosen fellow of that college June the 9th, 1707, after a very strict examination, which he went through with great credit. The first public proof he gave of his literary abilities was his “Arithmetica absque Algebra aut Euclide demonstrata;” which, from the preface, he appears to have written before he was twenty years old, though he did not publish it till 1707. It is dedicated to Mr. Palliser, son to the archbishop of Cashel; and is followed by a mathematical miscellany, containing observations and theorems | inscribed to his pupil Mr. Samuel Molineux, whose father was the friend and correspondent of Locke. This little piece is so far curious, as it shews his early and strong passion for the mathematics, his admiration of those great names in philosophy, Locke and Newton, some of whose positions he afterwards ventured to call in question, and the commencement of his application to those more subtile metaphysical studies, to which his genius was peculiarly adapted. In 1709, came forth the “Theory of Vision,” which, of all his works, seems to do the greatest honour to his sagacity; being, as Dr. Reid observes, the first attempt that ever was made to distinguish the immediate and natural objects of sight, from the conclusions we have been accustomed from infancy to draw from them. The boundary is here traced out between the ideas of sight and touch; and it is shewn, that, though habit has so connected these two classes of ideas in our minds, that they are not without a strong effort to be separated from each other, yet originally they have no such connection; insomuch, that a person born blind, and suddenly made to see, would at first be utterly unable to tell how any object that affected his sight would affect his touch; and particularly would not from sight receive any idea of distance, outness, or external space, but would imagine all objects to be in his eye, or rather in his mind. This was surprisingly confirmed in the case of a young man born blind, and couched at fourteen years of age by Mr. Cheselden, in 1728. 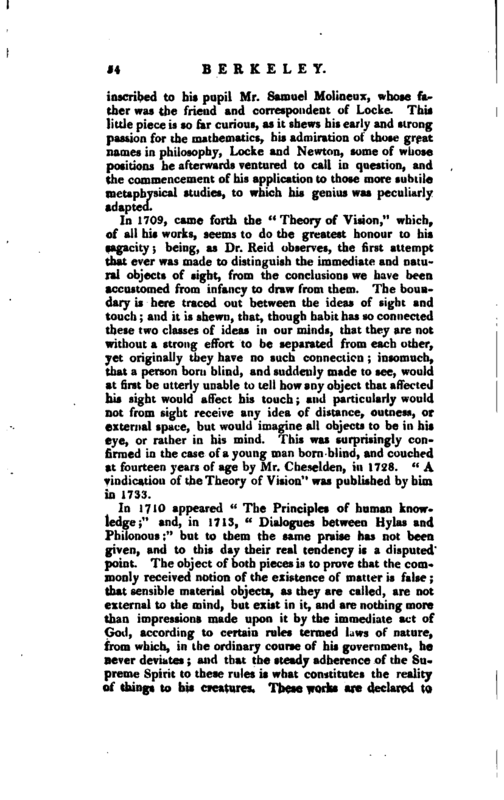 “A vindication of the Theory of Vision” was published by him in 1733. His hopes of preferment expiring with the fall of queen Anne’s ministry, he some time after embraced an offer made him by Dr. St. George Ashe, bishop of Clogher, of accompanying his son in a tour through Europe. When he arrived at Paris, having more leisure than when he first passed through that city, Mr. Berkeley took care to pay his respects to his rival in metaphysical sagacity, the illustrious Pere Malebranche. He found this ingenious father in his cell, cooking in a small pipkin a medicine for a disorder with which he was then troubled, an inflammation on the lungs. The conversation naturally turned on our author’s system, of which the other had received some knowledge from a translation just published. But the issue of this debate proved tragical to poor Malebranche. In the heat of disputation he raised his voice so high, and. gave way so freely to the natural impetuosity of a man of parts and a Frenchman, that he brought on himself a | violent increase of his disorder, which carried him off a few days after. In this excursion Mr. Berkeley employed four years and, besides those places which fall within, the grand tour, visited some that are less frequented. He travelled over Apulia (from which he wrote an account of the tarantula to Dr. Freind), Calabria, and the whole island of Sicily. This last country engaged his attention so strongly, that he had with great industry collected very considerable materials for a natural history of it, but unfortunately lost them in the passage to Naples. 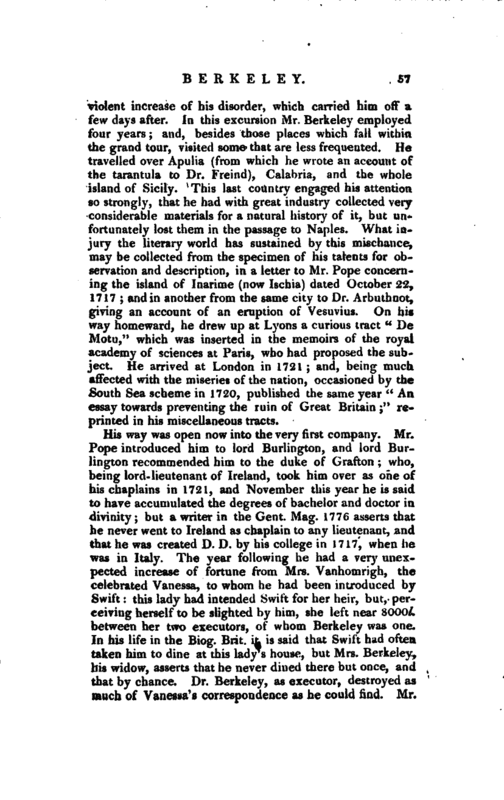 What injury the literary world has sustained by this mischance, may be collected from the specimen of his talents for observation and description, in a letter to Mr. Pope concerning the island of Inarime (now Ischia) dated October 22, 1717; and in another from the same city to Dr. Arbuthnot, giving an account of an eruption of Vesuvius. On his way homeward, he drew up at Lyons a curious tract “De Motu,” which was inserted in the memoirs of the royal academy of sciences at Paris, who had proposed the subject. He arrived at London in 1721; and, being much affected with the miseries of the nation, occasioned by the South Sea scheme in 1720, published the same year “An essay towards preventing the ruin of Great Britain;” reprinted in his miscellaneous tracts. His way was open now into the very first company. Mr. Pope introduced him to lord Burlington, and lord Burlington recommended him to the duke of Grafton who, being lord-lieutenant of Ireland, took him over as one of his chaplains in 1721, and November this year he is said to have accumulated the degrees of bachelor and doctor in divinity; but a writer in the Gent. Mag. 1776 asserts that he never went to Ireland as chaplain to any lieutenant, and that he was created D. D. by his college in 1717, when he was in Italy. The year following he had a very unexpected increase of fortune from Mrs. Vanhomrigh, the celebrated Vanessa, to whom he had been introduced by Swift this lady had intended Swift for her heir, but, perceiving herself to be slighted by him, she left near 8000l. between her two executors, of whom Berkeley was one. In his life in the Biog. Brit, it is said that Swift had often taken him to dine at this lady’s house, but Mrs. Berkeley, his widow, asserts that he never dined there but once, and that by chance. Dr. Berkeley, as executor, destroyed as much of Vanessa’s correspondence as he could find. Mr. | Marshal, the other executor, published the “Cadenus and Vanessa,” which, according to Dr. Delany, proved fatal to Stella. May 18, 1724, he was promoted to the deanery of Derry, worth 1100l. per annum, and resigned his fellowship. 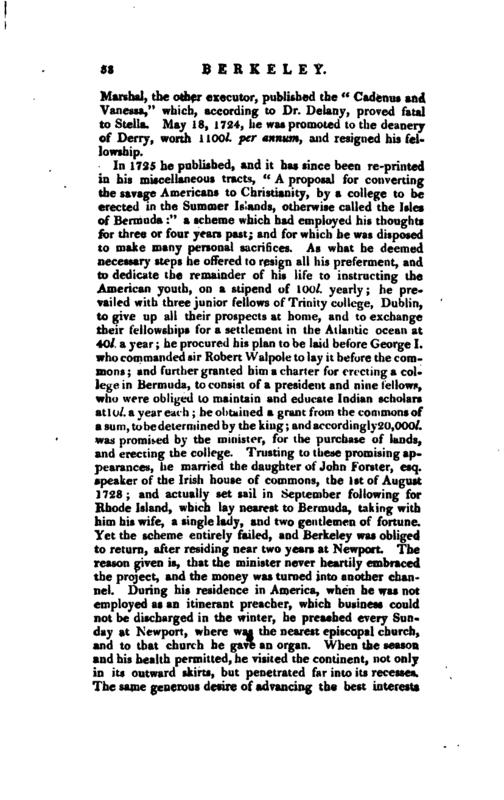 In 1725 he published, and it has since been re-printed in his miscellaneous tracts, “A proposal for converting the savage Americans to Christianity, by a college to be erected in the Summer Islands, otherwise called the Isles of Bermuda” a scheme which had employed his thoughts for three or four years past; and for which he was disposed to make many personal sacrifices. As what he deemed necessary steps he offered to resign all his preferment, and to dedicate the remainder of his life to instructing the American youth, on a stipend of 100l. yearly; he prevailed with three junior fellows of Trinity college, Dublin, to give up all their prospects at home, and to exchange their fellowships for a settlement in the Atlantic ocean at 40l. a year he procured his plan to be laid before George I. who commanded sir Robert Walpole to lay it before the commons and further granted him a charter for erecting a college in Bermuda, to consist of a president and nine fellow? :, who were obliged to maintain and educate Indian scholars atlO/. a year each he obtained a grant from the commons of a sum, to be determined by the king and accordingly 20,000l. was promised by the minister, for the purchase of lands, and erecting the college. Trusting to these promising appearances, he married the daughter of John Forster, esq. speaker of the Irish house of commons, the 1st of August 3728; and actually set sail in September following for Rhode Island, which lay nearest to Bermuda, taking with him his wife, a single lady, and two gentlemen of fortune. Yet the scheme entirely failed, and Berkeley was obliged to return, after residing near two years at Newport. The reason given is, that the minister never heartily embraced the project, and the money was turned into another channel. During his residence in America, when he was not employed as an itinerant preacher, which business could not be discharged in the winter, he preached every Sunday at Newport, where was the nearest episcopal church, and to that church he gave an organ. When the season and his health permitted, he visited the continent, not only in its outward skirts, but penetrated far into its recesses. The same generous desire of advancing the best interests | of mankind which induced him to cross the Atlantic, uniformly actuated him whilst America was the scene of his ministry. The missionaries from thfe English society, who resided within about a hundred miles of Rhode Island, agreed among themselves to hold a sort of synod at Dr. Berkeley’s house there, twice in a year, in order to enjor the advantages of his advice and exhortations. Four of these meetings were accordingly held. One of the principal points which the doctor then pressed upon his fellowlabourers, was the absolute necessity of conciliating, by all innocent means, the affection of their hearers, and also of their dissenting neighbours. His own example, indeed, very eminently enforced his precepts upon this head for it is scarcely possible to conceive a conduct more uniformly kind, tender, beneficent, and liberal than his xvas. He seemed to have only one wish in his heart, which was to alleviate misery, and to diffuse happiness. Finding, at length, that the fear of offending the dissenters at home, and of inclining the colonies to assert independency, had determined the minister to make any use, rather than the best use, of the money destined for, and promised to St. Paul’s college, the dean of Derry took a reluctant leave of a country, where the name of Berkeley was long and justly revered more than that of any European whatever. At his departure, he gave a farm of a hundred acres, which 1,-jy round his house, and his house itself, as a benefaction to Yale and Harvard colleges: and the value of that land, then not insignificant because cultivated, became afterwards very considerable. He gave, of his own property, to one of these colleges, and to several missionaries, books to the amount of five hundred pounds. To the other college he made a large donation of books purchased by others, and trusted to his disposal. In 1732, he published “The Minute Philosopher,” in f vols. 8vo. This masterly work is written in a series of dialogues on the model of Plato, a philosopher of whom he is said to have been very fond; and in it he pursues the freethinker through the various characters of atheist, libertine, enthusiast, scorner, critic, metaphysician, fatalist, and sceptic. We have already related by what means, and upon what occasion, Dr. Berkeley had first the honour of being known to queen Caroline. This princess delighted much in attending to philosophical conversations between learned | and ingenious men for which purpose she had, when princess of Wales, appointed a particular day in the week, when the most eminent for literary abilities at that time in England were invited to attend her royal highness in the evening a practice which she continued after her accession to the throne. 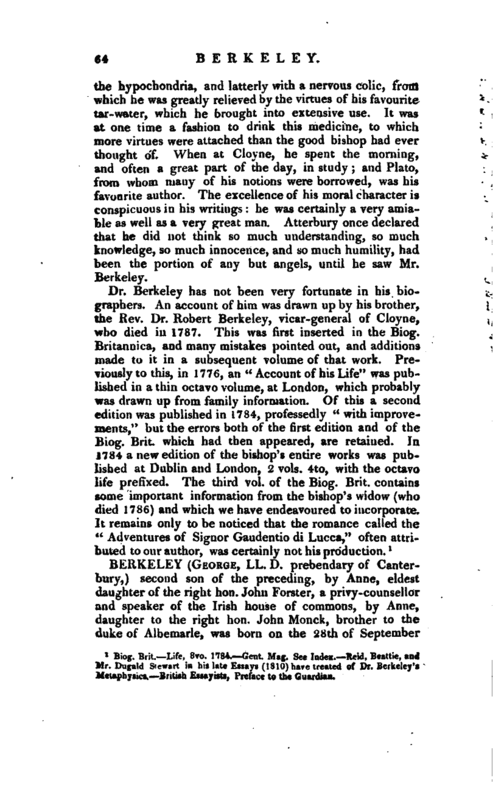 Of this company were doctors Clarke,­Hoadly, Berkeley, and Sherlock.- Clarke and Berkeley were generally considered as principals in the debates that arose upon those occasions; and Hoadly adhered to the former, as Sherlock did to the latter. Hoadly was no friend to our author: he affected to consider his philosophy and his Bermuda project as the reveries of a visionary. 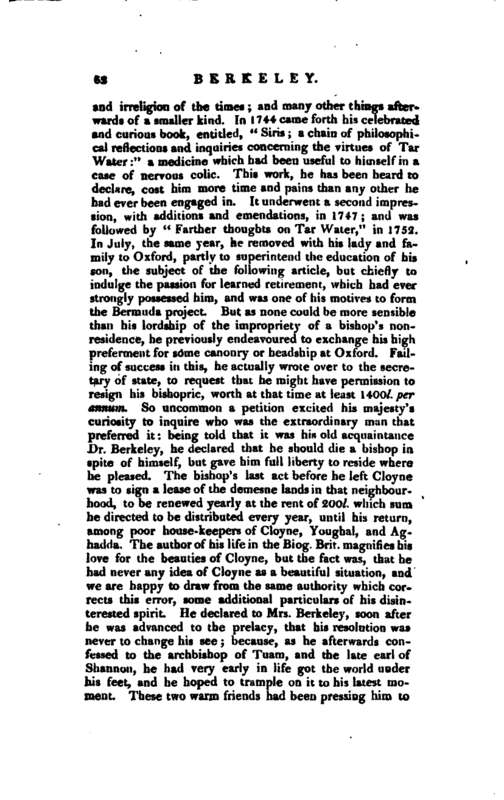 Sherlock (who was afterwards bishop of London) on the other hand warmly espoused his cause and particularly, when the “Minute Philosopher” came out, he carried a copy of it to the queen, and left it to her majesty to determine, whether such a work could be the production of a disordered understanding. After dean Berkeley’s return from Rhode Island, the queen often commanded his attendance to discourse with him on what he had observed worthy of notice in America. His agreeable and instructive conversation, engaged that discerning princess so much in his favour, that the rich deanery of Down in Ireland falling vacant, he was at her desire named to it, and the king’s letter actually came over fqr his appointment. 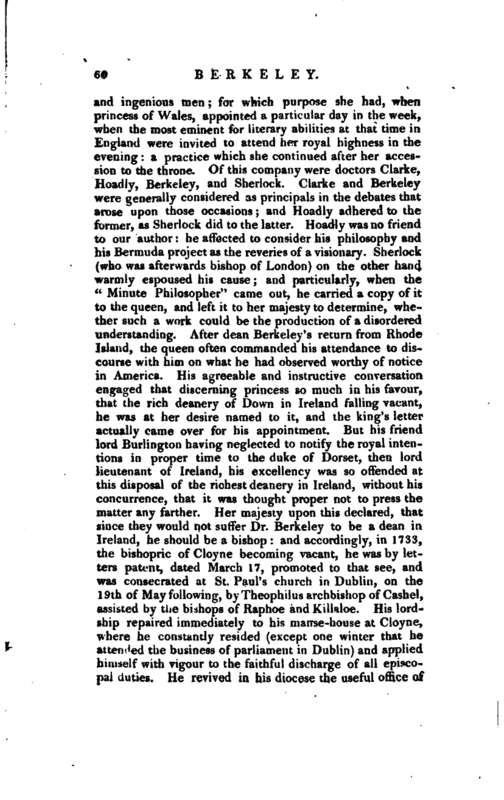 But his friend lord Burlington having neglected to notify the royal intentions in proper time to the duke of Dorset, then lord lieutenant of Ireland, his excellency was so offended at this disposal of the richest deanery in Ireland, without his concurrence, that it was thought proper not to press the matter any farther. Her -majesty upon this declared, that since they would not suffer Dr. Berkeley to be a dean in Ireland, he should be a bishop and accordingly, in 1733,­the bishopric of Cioyne becoming vacant, he was by letters patent, dated March 17, promoted to that see, and was consecrated at St. Paul’s church in Dublin, on the 19th of May following, byTheophilus archbishop of Cashel, assisted by the bishops of Raphoe and Killaloe. His lordship repaired immediately to his manse-house at Cioyne, where he constantly resided (except one winter that he attended the business of parliament in Dublin) and applied himself with vigour to the faithful discharge of all episcopal duties. He revived in his diocese the useful office of | rural dean, which had gone into disuse visited frequently parochially and confirmed in several parts of his see. 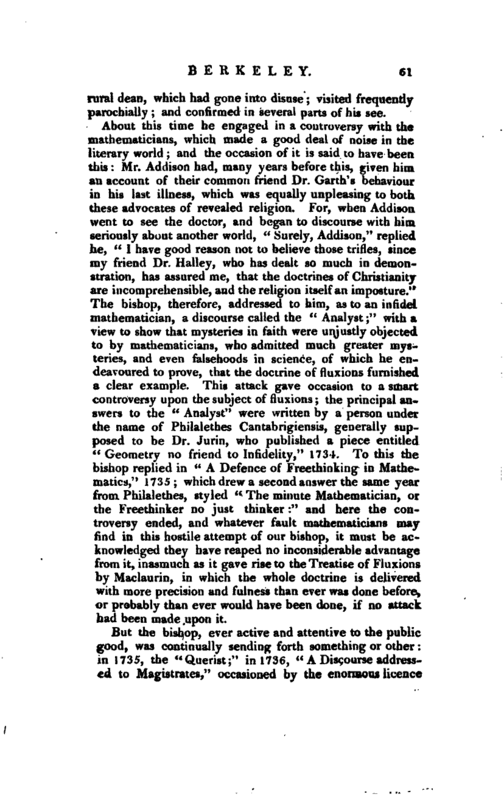 About this time he engaged in a controversy with the mathematicians, which made a good deal of noise in the literary world and the occasion of it is said to have been, this: Mr. Addison had, many years before this, given him an account of their common friend Dr. Garth’s behaviour in his last illness, which was equally un pi easing to both these advocates of revealed religion. For, when Addison. went to see the doctor, and began to discourse with him seriously about another world, “Surely, Addison,” replied he, “I have good reason not to believe those trifles, since my friend Dr. Halley, who has dealt so much in demonstration, has assured me, that the doctrines of Christianity are incomprehensible, and the religion itself an imposture.” The bishop, therefore, addressed to him, as to an infidel mathematician, a discourse called the “Analyst” with-a view to show that mysteries in faith were unjustly objected to by mathematicians, who admitted much greater mysteries, and even falsehoods in science, of which he endeavoured to prove, that the doctrine of fluxions furnished a clear example. This attack gave occasion to a smart controversy upon the subject of fluxions the principal answers to the “Analyst” were written by a person under the name of Philalethes Cantabrigiensis, generally supposed to be Dr. Jurin, who published a piece entitled “Geometry no friend to Infidelity,” 1734. To this the bishop replied in “A Defence of Freethinking in Mathematics,” 1735; which drew a second answer the same year from Philalethes, styled “The minute Mathematician, or the Freethinker no just thinker” and here the controversy ended, and whatever fault, mathematicians may find in this hostile attempt of our bishop, it must be acknowledged they have reaped no inconsiderable advantage from it, inasmuch as it gave rise to the Treatise of Fluxions by Maclaurin, in which the whole doctrine is delivered with more precision and fulness than ever was done before, or probably than ever would have been done, if no attack had been made upon it. But the bishop, ever, active and attentive to the public good, was continually sending forth something or o-ther in 1735, the “Querist;” in 1736, “A Discourse addressed to Magistrates,” occasioned by the enormous licence | and irreligion of the times and many other things afterwards of a smaller kind. 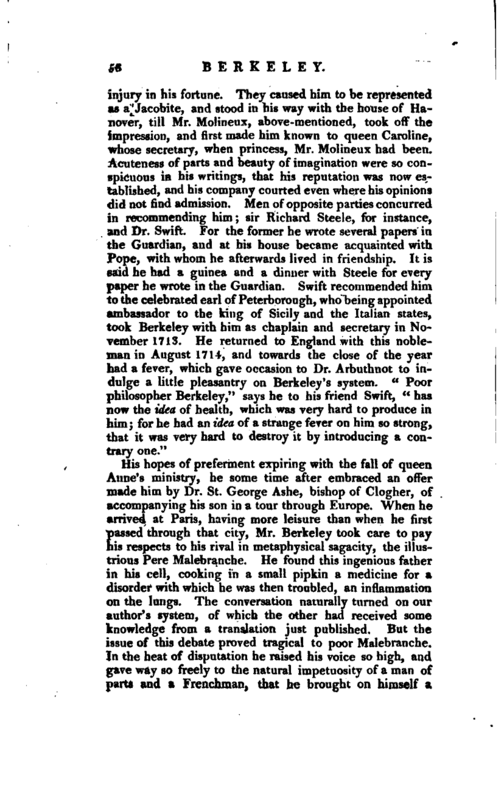 In 1744 came forth his celebrated and curious book, entitled, “Siris a chain of philosophical reflections and inquiries concerning the virtues of Tar Water” a medicine which had been useful to himself in a case of nervous colic. This work, he has been heard to declare, cost him more time and pains than any other he had ever been engaged in. It underwent a second impression, with additions and emendations, in 1747 and was followed by “Farther thoughts on Tar Water,” in 1752. 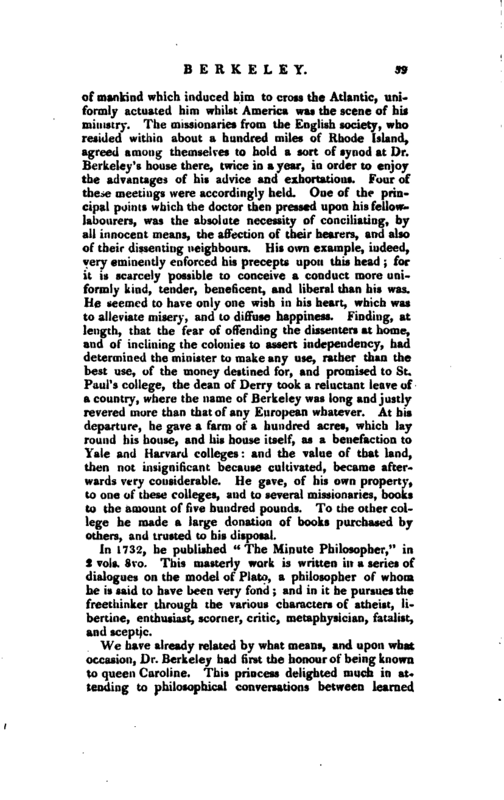 In July, the same year, he removed with his lady and family to Oxford, partly to superintend the education of his son, the subject of the following article, but chiefly to indulge the passion for learned retirement, which had ever strongly possessed him, and was one of his motives to form the Bermuda project. But as none could be more sensible tban his lordship of the impropriety of a bishop’s nonresidence, he previously endeavoured to exchange his high preferment for some canonry or headship at Oxford. Failing of success in this, he actually wrote over to the secretary of state, to request that he might have permission to resign his bishopric, worth at that time at least 1400l. per annum. So uncommon a. petition excited his majesty’s curiosity to inquire who was the extraordinary man that preferred it: being told that it was his old acquaintance Dr. Berkeley, he declared that he should die a bishop in spite of himself, but gave him- full liberty to reside where he pleased. The bishop’s last act before he left Cloyne was to sign a lease of the demesne lands in that neighbourhood, to be renewed yearly at the rent of 200l. which sum he directed to be distributed every year, until his return, among poor house-keepers of Cloyne, Youghal, and Aghadtla. The author of his life in the Biog. Brit, magnifies his love for the beauties of Cloyne, but the fact was, that he had never any idea of Cloyne as a beautiful situation, and we are happy to draw from the same authority which corrects this error, some additional particulars of his disinterested spirit. He declared to Mrs. Berkeley, soon after he was advanced to the prelacy, that his resolution was never to change his see; because, as he afterwards confessed to the archbishop of Tuam, and the late earl of Shannon, he had very early in life got the world uuder his feet, and he hoped to trample on it to his latest moment. These iv/o warm friends had bee pressing him to | think of a translation but he did not love episcopal translations. 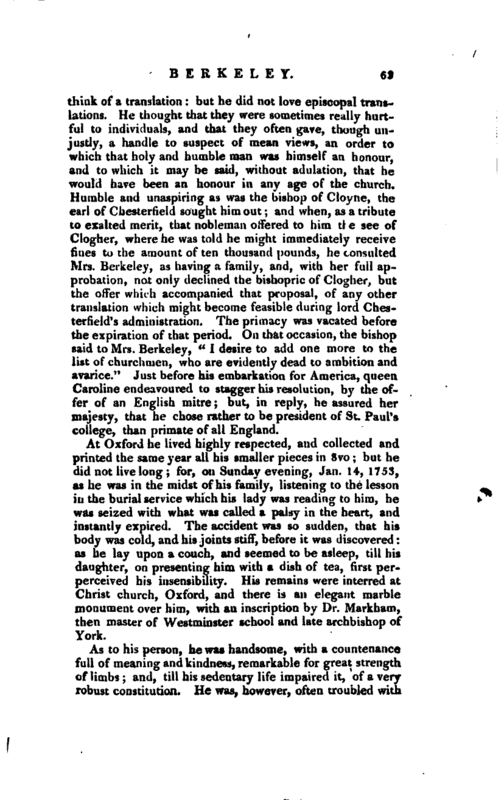 He thought that they were sometimes really hurtful to individuals, and that they often gave, though unjustly, a handle to suspect of mean views, an order to which that holy and humble man was himself an honour, and to which it may be said, without adulation, that he would have been an honour in any age of the church. Humble and unaspiring as was the bishop of Cloyne, the earl of Chesterfield sought him out and when, as a tribute to exalted merit, that nobleman offered to him tl e see of Clogher, where he was told he might immediately receive fines to the amount of ten thousand pounds, he consulted Mrs. Berkeley, as having a family, and, with her full approbation, not only declined the bishopric of Clogher, but the offer which accompanied that proposal, of any other translation which might become feasible during lord Chesterfield’s administration. The primacy was vacated before the expiration of that period. On that occasion, the bishop said to Mrs. Berkeley, “I desire to add one more to the list of churchmen, who are evidently dead to ambition and avarice.” Just before his embarkation for America, queen Caroline endeavoured to stagger his resolution, by the offer of an English mitre but, in reply, he assured her majesty, that he chose rather to be president of St. Paul’s college, than primate of all England. At Oxford he lived highly respected, and collected and printed the same year all his smaller pieces in 8vo but he did not livelong for, on Sunday evening, Jan. 14, 1753, as he was in the midst of his family, listening to the lesson in the burial service which his lady was reading to him, he was seized with what was called a palsy in the heart, and instantly expired. The accident was so sudden, that his body was cold, and his joints stiff, before it was discovered as he lay upon a couch, and seemed to be asleep, till his daughter, on presenting him with a dish of tea, first perperceived his insensibility. His remains were interred at Christ church, Oxford, and there is an elegant marble monument over him, with an inscription by Dr. Markham, then master of Westminster school and late archbishop of York. As to his person, he was handsome, with a countenance full of meaning and kindness, remarkable for great strength of limbs; and, till his sedentary life impaired it, of a very robust constitution. He was, however, often troubled with | the hypochondria, and latterly with a nervous colic, from which he was greatly relieved by the virtues of his favourite tar-water, which he brought into extensive use. It was at one time a fashion to drink this medicine, to which more virtues were attached than the good bishop had ever thought of. When at Cloyne, he spent the morning, and often a great part of the day, in study and Plato, from whom many of his notions were borrowed, was his favourite author. The excellence of his moral character is conspicuous in his writings he was certainly a very amiable as well as a very great man. Atterbury once declared that he did not think so much understanding, so much knowledge, so much innocence, and so much humility, had been the portion of any but angels, until he saw Mr. Berkeley. Biog. Brit. Life, 8vo. 1734. —Gent. Mag. See Indeic. 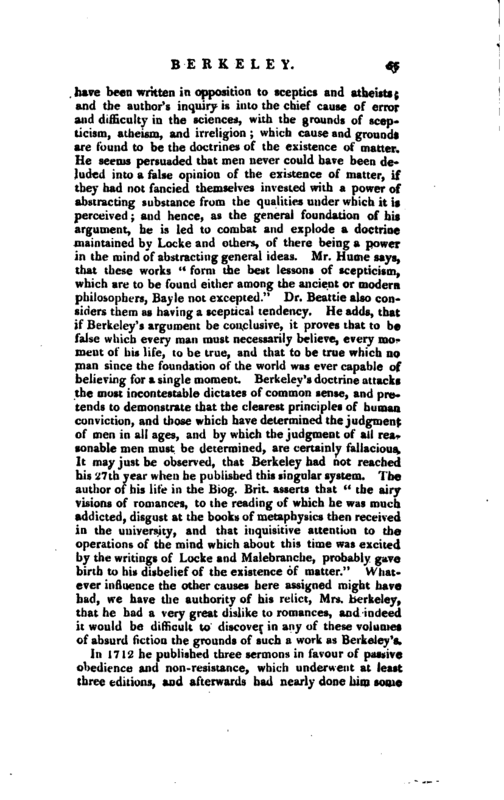 Reid, Seattle, and Mr. Dugald Stewart in his late Essays (1810) have treated of Dr. Berkeley’s Metaphysics. British Essayists, Preface to the Guardian.